Today, the Half Cent Coin remembers when General William Hull surrendered Fort Detroit without engaging the enemy on August 16, 1812. The contentious war of 1812 started just a few months earlier. Was the communication from the government in Washington clear? Did General Hull have all the resources he needed? The History of the War, Between the United States and Great-Britain, which Commenced in June, 1812, and Closed in Feb. 1815, compiled by J. Russell, Jr., published in 1815, provided many details about conflict. H. Q. Detroit, Aug. 16, 1812. It is with pain and anxiety that Brigadier General Hull announces to the North-Western army, that he has been compelled from a sense of duty, to agree to the following articles of capitulation. Article 1st. Fort Detroit with all the troops, regulars as well as militia, will be immediately surrendered to the British forces under command of Major-General Brock, and will be considered as prisoners of war, with the exception of such of the Militia of the Michigan territory, who have not joined the army. Article 2d. All public stores, arms, and public documents, including everything else of a public nature, will be immediately given up. Article 3d. Private persons and private property of every description will be respected. Article 4th. His Excellency Brig. General Hull, having expressed a desire that a detachment from the state of Ohio, on its way to join the army, as well as one sent from fort Detroit, under the command of Col. M’Arthur, should be included in the above stipulation, it is accordingly agreed to. It is, however, to be understood, that such parts of the Ohio militia as have not joined the army, will be permitted to return home on condition that they will not serve during the war—their arms, however, will be delivered up if belonging to the public. Article 5th. The garrison will march out at the hour of 12 o’clock this day, and the British forces will take immediate possession of the fort. J. M’DOWEL, Lt. Col. Militia B. A. D. C.
I. B. GREGG, Major A. D. C.
(Approved). WILLIAM HULL, Brig. Gen.
JAMES MILLER, Lt. Col. 5th U. S. Infantry. E. BRUSH, Col. 1st. Regt. Michigan Militia. (Approved) ISAAC BROCK, Maj. Gen. The army at 12 o’clock this day will march out of the east gate, where they will stack their arms, and will be then subject to the articles of capitulation. By Isaac Brock, Esq. Major-General, commanding his majesty’s forces in the province of Upper Canada. Whereas the Territory of Michigan was this day by capitulation, ceded to the arms of his Britannic majesty, without any other condition than the protection of private property; and wishing to give an early proof of the moderation and justice of the government, I do hereby announce to all the inhabitants of the said Territory that the laws heretofore in existence shall continue in force until his majesty’s pleasure be known, or so long as the peace and safety of the Territory will admit thereof. And I do hereby also declare and make known to the said inhabitants that they shall be protected in the full exercise and enjoyment of their religion; of which all persons, both civil and military, will take notice and govern themselves accordingly. All persons having in their possession, or having any knowledge of any public property, shall forthwith deliver in the same, or give notice thereof to the officer commanding, or to Lt. Col. Nichol, who are hereby authorized to receive and give proper receipts for the same. Officers of militia will be held responsible that all arms in possession of militia-men be immediately delivered up; and all individuals whatever, who have in their possession arms of any kind, will deliver them up without delay. Given under my hand at Detroit, this 16th day of August, 1812, and in the 52d year of his majesty’s reign. 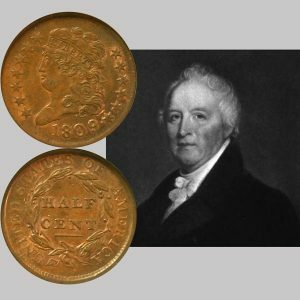 J. M’DONNELL, Lt. Col, Militia & A. D. C.
The Half Cent Coin shows with an image of William Hull, circa 1813.